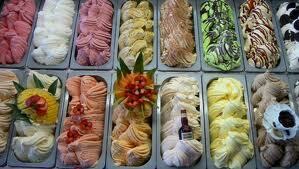 Cool Sicilian Gelato. Join us to Sicily for Christmas Markets, Archaeology, Farm Food and More. Joe Sharkey wrote about Hotel Peeves the other day. He mentioned two top hotel complaints: bulky internet or expensive internet service and hard to reach power outlets. Well if you get to women’s complaints. We agree that paying egregiously for internet is annoying and definitely we are tired of moving furniture to recharge our phones. Dirty floors: many women either stretch or do yoga in the morning. We become too familiar with the filth on hotel floors. Not all of it is seen but once you are on the floor, it is felt. Hair dryers that require you to hold down a button for power. Drying long hair with these means finger cramps. Combo shampoo/conditioner which leaves your hair neither totally clean nor totally conditioned. Faux ‘green’ recyclable bottles that are impossible to squeeze so you cannot get the lotions out of them without serious banging on the counter. Alarm clocks that are set and go off at 5AM from someone else’s schedule or from a power outage. And worst of all during the Summer, that air conditioning which is turned off by the hotel during the midnight hours because management thinks you will not wake up. Having said all that, The Women’s Travel Group is off again Oct 9/10 to Canyon Ranch at a 35% discount, then to Sicily in December and Morocco for Thanksgiving.